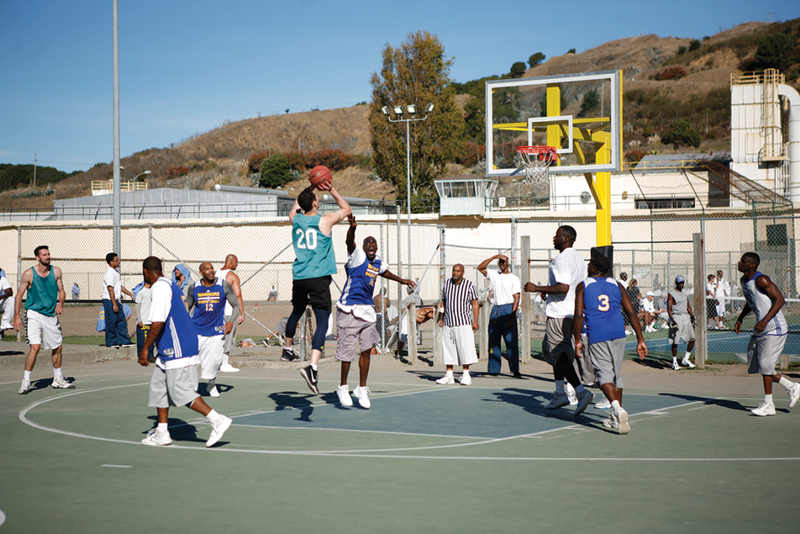 A road closure left the Green Team with only five players, including the 65-year old Don Smith, for a full court game schedule against the San Quentin Warriors, so they picked up two guys off the prison yard and won 99-92. “I was worried coming in with four guys,” David Liss, who played college basketball for Pomona, said. A shutdown highway left Prison Sport Ministry’s Green Team players Kevin Kelly, Antoine Maddox and Charles Lowery stuck in traffic with no way to reach San Quentin State Prison in time for the game. Alex Nesbitt a 25-year old from the Southside of Chicago who played for Harvard University, came in for the first time with the Green Team. They also had 6-foot-8 Robert Allen along with Dan Wohl, who played pro in Israel. 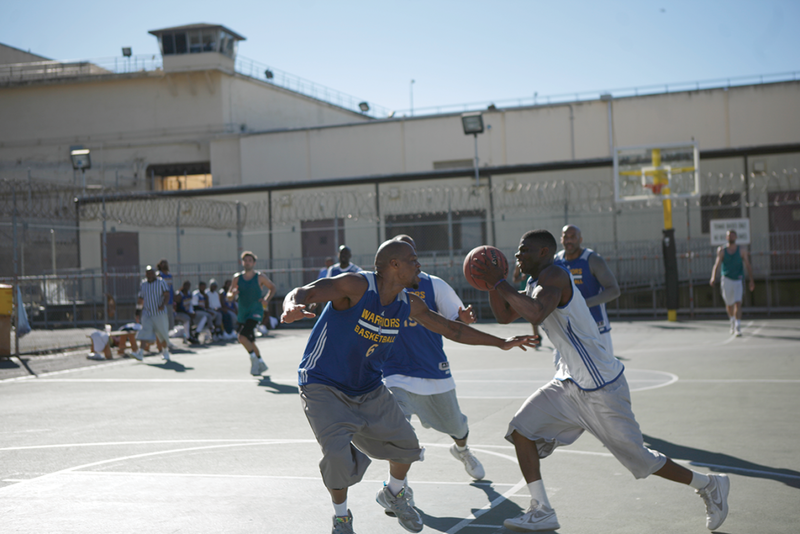 Meanwhile, the San Quentin Warriors’ starters warmed up in anticipation. For Tevin Fournette it would be one of his final three games as a Warrior. “This my last season; I go home in January,” Fournette said. Both Jonte Washington and Marcel Williams showed they may have what it takes to replace Fournette next season. Washington is 6-foot-7, 288 pounds and loves to shoot threes. Williams is young and all muscle. Neither play on the SQ Warriors, but both were on Intramural League teams. Williams won the 2018 Championship with a team called Apply Pressure. The Green Team picked up Washington and Williams without ever seeing them ball before. The Green Team took off in the first quarter and held a 49-42 lead by the end of the second. At half time Annie Smith, Don’s wife, delivered an inspirational message. She also remarked that coming into the prison with her husband, a sponsor of the Prison Sports Ministry program, helps her appreciate her life, even when she’s stuck in traffic. “Brian’s face pops up when I want to complain,” Annie said. She referred to what Brian Asey, general manager of the SQ basketball program who is serving multiple life sentences, always says. He would appreciate a chance to parole and experience many things free people gripe about. When the game resumed, the Green Team took a 17 point lead. Liss lit the Warriors up from three point land, making three in the quarter and six in the game. Williams scored in the paint on missed shots and going to the rack. Washington held down the boards. Wohl had the highlight play of the game with a ball-fake look off while he Europe- stepped passed two defenders to reach the rack for a layup which made the score 74-57 with 3:16 left in the third. In the fourth quarter, the Warriors charged back. Jamai Johnson made a hook shot to bring his team with 6 at 84-78 with 7:30 left in regulation. Fournette scored back-to-back baskets on offense, but the Green Team answered both times, which kept the Warriors at least six points away. Fournette led the Warriors with 25 points but Williams led all scorers with 26 points. Wohl added 24 and Liss made the third Green Team player who scored in the twenties with 21 points. Washington added 16.